In this final part, I am going to share with you about a powerful feng shui system called Qi Men Dun Jia. Loosely translated as 'Mystical Doors Escaping Technique', it is about placing yourself in the right place at the right time to get what you want. 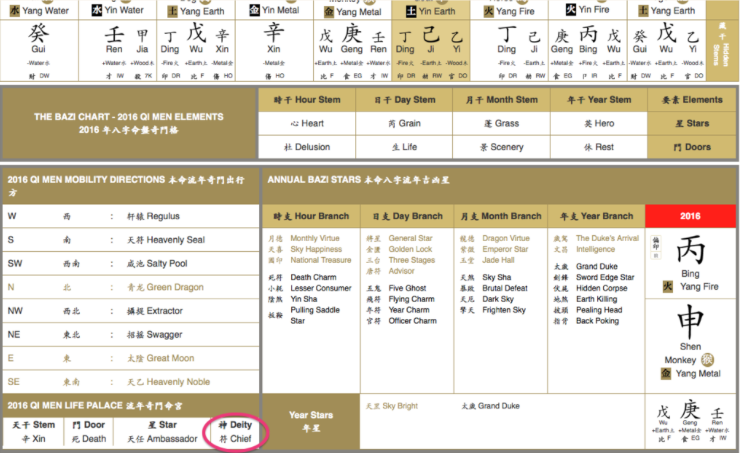 I have blogged about Qi Men Dun Jia (QMDJ) back in 2014 so if you are new to this subject, you may want to read THIS POST first to understand the basics. Anyway, during the seminar, Joey Yap taught us something which is quite similar to what he taught in the 2015 and 2014 seminars, but with a slight difference. Now I did not fully get everything that he said, so I would need readers who had attended this year's seminar to correct and help me out. Thanks! 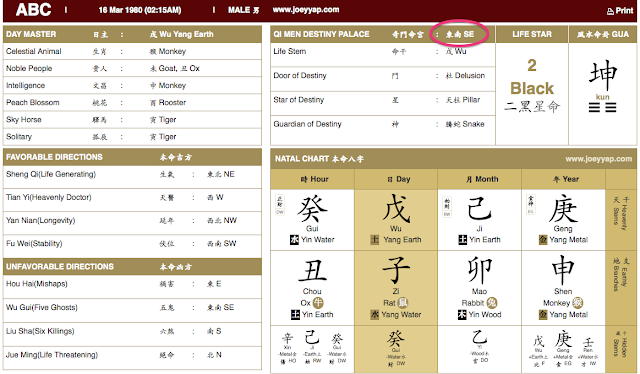 If you have not downloaded your Personal Bazi Chart from Joey Yap's site, please do so now HERE. Yes you need the chart from his site to follow what I am about to share with you. If you acquired your Bazi Chart elsewhere, that won't help because the information I am about to share can only be cross referenced with the chart you downloaded from Joey Yap's site. With the chart in your hands, now look at the direction of your Destiny Palace. Can you see that in 2016, the deity residing in the South East is the Chief Deity? (circled in red). This is the deity that Mr ABC must ask for help to get what he wants. Please take note the name deity here does not mean God - it's just a name and this is nothing religious. All those circled in purple are the other deities in each of the nine grids or palaces (except the centre grid which contains no deity). So you just need to look at which deity you are requesting help from. If your Destiny Palace is say, North East, then referring to the 2016 QMDJ Chart above, your deity this year is the Moon Deity. Get it? But if you still do not understand, don't worry. There is a short cut way to find out who is your Deity this year. All you need to do is look somewhere near the bottom left of your Personal Bazi Chart printout. Can you see the words '2016 Qi Men Life Palace' and the word 'Deity' in one of the columns? Using the example of Mr ABC, you can see that his Deity for this year is Chief just by looking at the area circled in red. Now look at your own printout. Who is your deity for this year? The Snake has the ability to increase your sixth sense and intuition. The Moon governs all knowledge and secrets, thereby helps you search for information. The Six Harmony helps in relationships and communication. The Nine Heaven helps you to warp reality by visualising what you want. The Nine Earth governs money and wealth, so if what you want is more money, then this deity is the one you need. The White Tiger gives you infinite energy and stamina. OK, so once you find out who your deity is for this year, then you can request for what you want. Now from my understanding (for those who know, please correct me if I am wrong), you can only ask for the things that each deity can provide. Meaning, if your deity is the Snake, you cannot ask for more money. (That's Nine Earth's job). Similarly, if your deity is White Tiger, you can't ask for a good relationship with someone. (That's the Six Harmony's specialty). Now that we are clear about that, let's move on to how to ask for what you want. Step 1 : Go to Alpha state. You can meditate, or use any techniques to get to a calm, Alpha state. Step 2 : Tap into the direction of your Life Palace. This means if your Life Palace is say, North, then you must sit with your back towards North (ie. sit facing South). Step 3 : Ask for what you want. Just ask as if you are talking to your Higher Self. This is not religious so you do not have to imagine you are praying to some kind of Deity. Now I am sure there are many of you who want more money but your Deity this year is not Nine Earth, so how? I am not exactly sure, but perhaps you can still get Nine Earth's help simply by sitting with your back towards Nine Earth's location which is South West (refer to the 2016 QMDJ Chart above) and asking for more money. However, since South West is not your Destiny Palace, you may find it harder to achieve what you want. It is easier when you ask from the Deity located in your Destiny Palace. OK, I may be wrong about this, so any experts can help me out here? OK, what happens if you are one of those people who can't meditate? What if you cannot bring yourself down to Alpha? Then the above method of asking for what you want is rendered useless. Luckily, Joey Yap offered two other QMDJ techniques. The second method is to choose your allies when you arrive at your 'battleground'. Now I am not very sure about this method so anyone who knows please correct me here. Let's say you want to close a deal that will make you lots of money. If you use the meditation method, you can ask Nine Earth deity to get you the deal and the money before you go to the 'battleground' (where you negotiate to seal the deal). But using the second method, you just go to the battleground and choose your allies. Your allies are the Green Dragon, Great Moon, Celestial Adviser and Heavenly Noble. 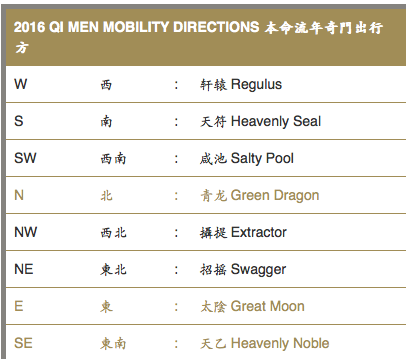 If you look at the your own personal printout, you can see the four allies under the heading 2016 Qi Men Mobility Directions. In Mr ABC's example above, he does not have the Celestial Adviser. OK at this point, I am a bit blur on what to do. So anyone who knows, please help me out. From my understanding, you try and close the deal facing one of the directions of your allies. So in Mr ABC's case, he needs to face either North (Green Dragon), East (Great Moon) or South East (Heavenly Noble) while closing the deal. Either that, or he needs to move (taking the hint from the words 'Mobility Directions') in the direction of North, East of South East towards the meeting place where he's supposed to close the deal. 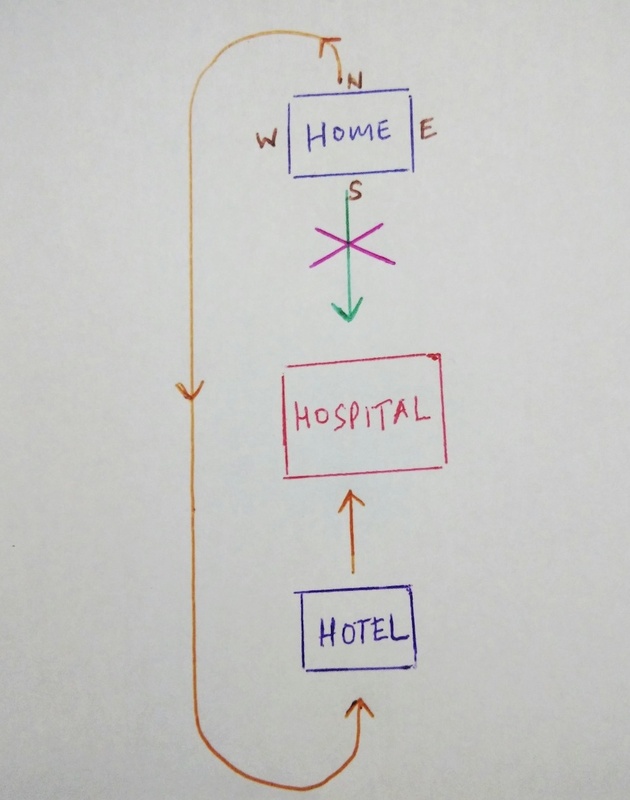 The third method is to travel to your direction of assistance. For example, if you are going to hospital for an operation and you want your operation to be successful, you look for the one of the good allies and choose a hospital that is in that direction in relation to your home.